Another quality UK series is coming to ABC2 after the 12 month window of exclusivity with BBC First shows ends. This time it’s Peaky Blinders, the gangster drama set in the lawless slum neighbourhoods of post war Birmingham. Starring Cillian Murphy and Sam Neill, this is a very contemporary, but sometimes bloody, period saga. The title pertains to the caps worn by gang members, where they hid their razor weapons. Returning soldiers, newly-minted revolutionaries and criminal gangs all fight for survival in an industrial landscape gripped by economic upheaval. Guns smuggled home from the trenches find their way onto the streets and become lethal currency. Communists don’t just dream of revolution – they are planning for it and the Government is expecting it. As Churchill mobilizes his Special Branch forces, illegal bookmakers make fortunes in speak-easy betting shops and traumatised infantrymen drink away their shellshock in riotous ale houses. There is still a gentler city at the fringes, where gypsies and canal boatmen deal horses and tell fortunes but sitting at the top of this industrial jungle are the extended Shelby family, whose many brothers, cousins and uncles, make up the fiercest gang of all, the ‘Peaky Blinders’. 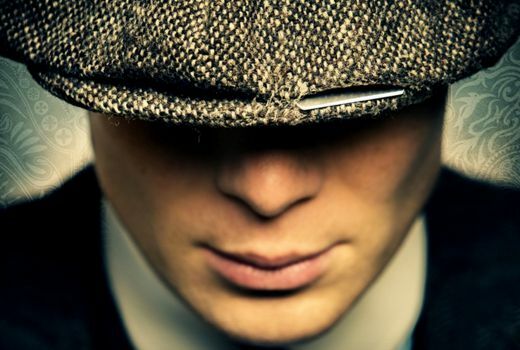 Named for their practice of sewing razor blades into the peaks of their caps, the Peaky Blinders make their money from illegal track betting, protection and robbery. Their boss Tommy is the most ruthless brother of them all, but his leadership is about to be put to the test. A ruthless new Police Chief arrives in town from Belfast to clean up the city and, perhaps more lethally, a beautiful woman arrives in the neighbourhood with a mysterious past and a dangerous secret. 9:20pm ABC2 Monday September 28th. Was awesome on Foxtel and I wished there was more series. +1 Cillian Murphy. What is going on with those eyes? I’ll watch anything with Cillian Murphy in it. Hope they market this properly. It’s actually pretty good. Far better than Underbelly Razor by comparison. Great Nick Cave sound track throughout too. Are they going to play both seasons together? I think BBCFirst did? I just finished watching season 2 on DVD from the library last night, great show.